The Top Performance Printed Apron offers low-cost protection against water and product stains while grooming. Features a bold zebra pattern in classic black and white, or two other striking color choices, each with an adjustable neck strap and back ties. 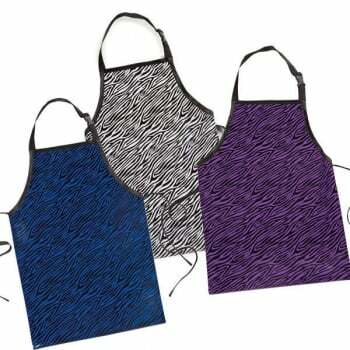 Look fashionable while protecting clothes against water or product stains with the Top Performance Printed Aprons. Value priced and fashion patterned, this will make a great addition to your grooming apparel wardrobe. Materials: 100% polyester, 30S vinyl.